Before we come to each of the places of sightseeing of the island, we will first have a look into the general information of the island Madeira; Where is the island Madeira at all? What is the character of the island? How is the climate in the flower island Madeira? Where is Madeira situated at all? Together with Porto Santo as also with some further little uninhabitated, Madeira forms an archipielago in the Atlantic. This archipielago is situated at approximately 600 km at the west of Morocco and/or 900 km at the south of the capital of Portugal Lissabon. While the Canarian Islands that are located at approximately 400 km in the further south are completly under spanish control, the islands around Madeira belong to Portugal. Basically, the whole archipielago are some big underwater mountains from which some peaks arise above the ocean surface. While the highest peak of Madeira, the Pico Ruivo de Santana, barely arises at a height of 1861 m, the whole island falls steeply for approximately 4000 m depth into the atlantic ocean - a massive range if one imagines this dimension. Madeira and Porto Santo are the only two islands that are inhabitaded. The 3 Ilhas Desertas (deserted islands) have a lack of potable water; this is why they are not inhabitated, or as the name simply says: deserted; Also the "deserts" that are situated further in the south are not inhabitated. 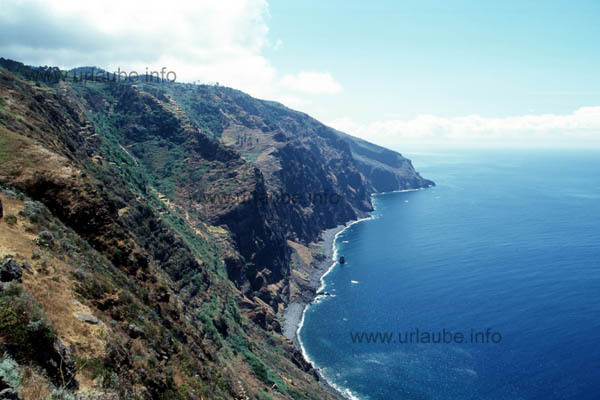 Madeira has a size of approximately 60 km on a maximum of 23 km. The total extent of the island is 150 km. With this, Madeira seems at first to be a tiny island. But actually, some hours are needed in order to get from one end to the other end of the island. How is the character of Madeira? As the whole island is a huge landscape of mountains that begins at the very bottom of the seanearly all coasts of the island are cliffy and abrupt. In Madeira, there are no dreamy white sandy beaches. But those who definetely need a sandy beach for bathing are very well served in the neighbour island Porto Santo. Surprinsingly, this island has exactly what Madeira does not have: long, beautiful, wide and inviting sand beaches. One gets to Porto Santo either from the capital of Madeira Funchal by vessel or by plane. Both islands have a distance of only 50 km to each other; the mere flight time to Porto Santo takes only 15 minutes. Porto Santo is approximately 20 times smaller than Madeira, but it is a side trip worth and probably also a holiday time. Those who believe now that Madeira is an uncomfortable and dry island due to its cliffy and abrupt coasts should definetely think about the climate of the atlantic region. At approximately 800 km at the north west of Madeira there are the Azores. The high- an low pressure areas that are originated in the area of the Azores amidst the Atlantic codetermine significantly our european weather. But the weather incidents in the Azores have also a massive influence on the Canarian Islands that are situated firther into the south as of course also on Madeira. In and around Madeira it is permanently clowded, that withdraw their humidity from the sea. This is the reason why there are a lot of falls in Madeira, and not only between autumn and spring time, but also in the summer time. The high mountain ranges act as weather cuttings, similar to the Alps that divide the north and the south European weather in two complety different climate zones. Thus, it can happen that one half of Madeira is completely clowded while the other half is delighted by marvellous sunshine. The half with more clowds is, of course, the north side of the island. Watching the foehn effects is a giant spectacle, when for example clowds are driven to the northern part of the mountain ridges. These slowly ascent and drift over the peaks away. In order to get over the high peaks, the clowds release some water which means it slightly rains. At the other side of the mountain ridge, dry air masses fall steeply down into the valley and dissolve, so that there is nothing but sunshine. 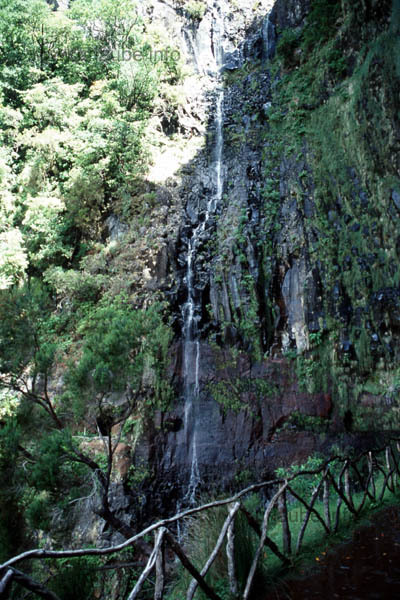 Thus, Madeira is an island with many rainfalls. Where there is much rain, there is plenty of water, and water combined with sun is exactly what the plants need. This is why Madeira is a gorgeous island. There, the plants and trees germinate form all corners. There are beautiful streets in which at the left and at the right side wild plants grow that would cost a lot of money at a german florist. Madeira is also called an spring island. On the island, it is spring time practically during the whole year. At each time of the year there are flower and trees blossoming. But a permanent spring time also means that the climate is very pleasant. In Madeira there are no unbearable temperatures like 40° in the shade. The usual temperatures are in the summer time around 25° and in the winter time between 15° and 20°. Specially in the summer time, the island barely cools down at night, which means that in the daytime and at nights there are nearly the same pleasant temperatures. Also, one hardly notices the differences of the temperature if, for example, one drives up from the coast to a height of 1000 m. These constant temperatures are very pleasant, but if one does for example a hiking tour it can get realy unpleasant if there is no air conditioning in the hotel room. As a visitor of Madeira, one has always to get prepared for one thing: either in the summer time as also in the winter there can be short rain falls. These showers that are very short in the summer time are not unpleasant at all; oftenly, a little refreshment from above does well good during a hiking tour; Neither are the rainfalls cold but have a nice temperature as one was standing under the shower. There is further information about the weather and the climate in the island Madeira with some tables and graphics in our special side Weather and climate in Madeira.